CC ACRES is a secluded 38 acre horse ranch located in historic Sharps Chapel, TN. 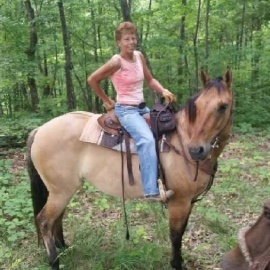 We offer wrangler assisted trail horse rentals. Our ranch is completely bordered by Chuck Swan Wildlife Management Forest. Chuck Swan is a peninsula surrounded by Norris Lake. Norris Lake's waters are not far away and the lake is a favorite for all types of water-sport recreation & activities. In addition to our horseback riding adventures, we now offer campsites for trail riders bringing their own horses for overnight. 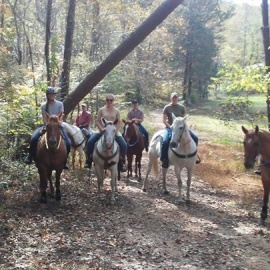 HORSEBACK RIDE NORRIS LAKE! Take time to meander trails, creeks, ridges, & hollows through the pristine forest of Chuck Swan Wildlife Management Area's 24,000+ acres with over 70 miles of trails. Discover old cemeteries and home places, abandoned mine and fisheries, mysterious caves and springs. NOT YOUR ORDINARY NOSE-TO-TAIL RIDES! We offer "freestyle" recreational type riding. Affordable custom ride packages geared to the riding level and desires of your group. From our 2hr rides to all-day rides.....RESERVE AN ADVENTURE FOR YOU AND YOUR FAMILY/FRIENDS TODAY!